Play. Learn. Understand. Share - Our vision towards creating great experiences! Nordlys - Hipp Hipp Hurra! Kvalvik Bait is a revolutionary new cream-like bait that attracts a variety of fishes by their keen sense of smell. 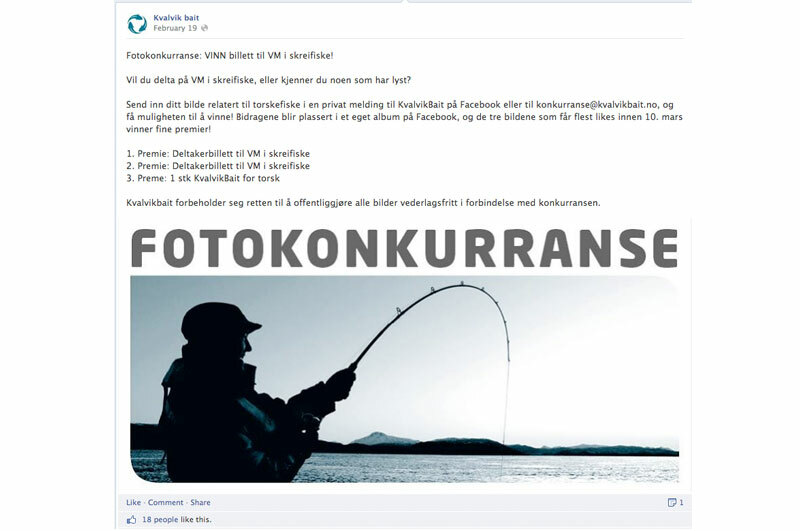 Kvalvik Bait was looking to increase their exposure via social media. We worked on a series of engagement posts that used good captivating taglines, applied good use of targeted advertising and a “like to qualify” competition mechanic where participants can receive a free tube of Kvalvik Bait to try out or other great prizes by 'liking' and 'commenting' on posts. With the relaxation of Facebook competition rules, we have created several photo competitions directly on Kvalvik Bait’s page by creating a photo folder and encouraged users to submit pictures via Facebook messages or email. We have received up to 22 contributions for different contests, and winners were picked by acquiring the most likes, thus making the competition effectively viral! Kvalvik Bait grew from 127 Likes to over 600 likes in the period that we worked with them. Welcome to the webpage of Plus Point AS,an interactive studio based in the Arctic fringes of Tromsø. Norway, where our developers live to create! We do app-, web- and game development, and as game creators we like to think in a different way!